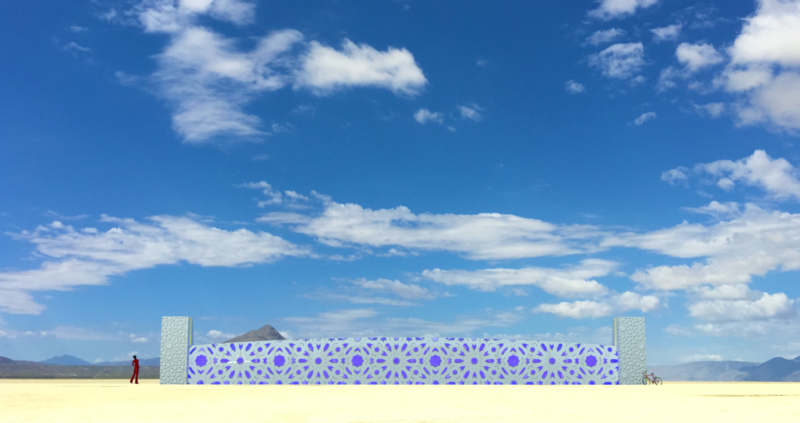 ROSHANAI comprises two double-walled panels that create a 100-ft long tunnel of light and sound with a 3-ft corridor. The sides of the hallway rise from 8-ft tall at the ends to 12-ft tall at the apex in the middle. Simultaneously, the panels sink into the ground to form a shallow valley. Fractal arrangements of Islamic geometric patterns are cut into the outside panels, lit from within to illuminate the patterns and cast fantastic night shadows. The entrances will be gates inspired by the Great Mosque of Isfahan (Iran), pointed arches filled with sacred geometry. The inside walls are solid and uplit from daylight-visible LED spotlights embedded in the edges of the floor. Raised calligraphy will cover the lower ⅔ of the inner length of the corridor – words from across the Muslim world describing light, knowledge, respect, love, peace. Roshanai is lit in monochromatic hues that change every few minutes, with the color of the inside wall being complementary to the outside wall color. Proximity sensors in the gates and inside walls trigger rotary solenoids, which control the striking of metal hammers on the walls, creating an interactive sound effect. When a lone participant enters the tunnel, the hammers start striking in sequence down the corridor, creating a sound wave of varying pitch (Doppler effect). The syncopated cacophony of metal on metal surrounds you, traveling towards and away from you in waves. As more people fill Roshanai, the sound hammers play programmed rhythms. Roshanai comprises two double-walled panels that create a 100-ft long tunnel of light and sound with a 36” wide corridor. The sides of the hallway rise from 8-ft tall at the ends to 12-ft tall at the apex in the middle. Simultaneously, the panels sink into the ground to form a shallow valley. 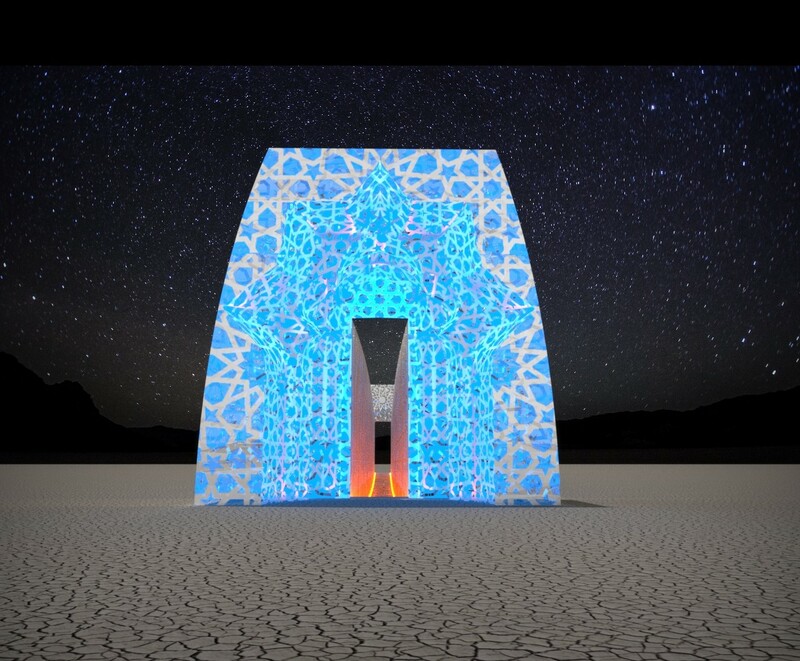 Fractal arrangements of Islamic geometric patterns are cut into the outside panels, lit from within to illuminate the patterns and cast fantastic night shadows. Roshanai is lit in monochromatic hues that change every few minutes, with the color of the inside wall being complementary to the outside wall color. 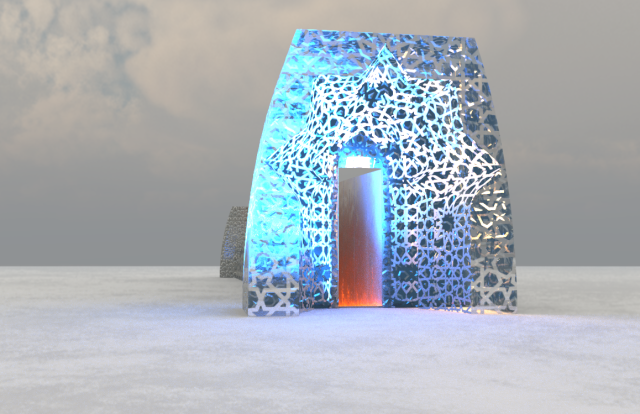 The entrances will be complex arabesque gates inspired by the Great Mosque of Isfahan (Iran), pointed arches filled with sacred geometry (not shown in the illustration). The inside walls are solid and uplit from daylight visible LED spotlights embedded in the edges of the floor. Raised calligraphy will cover the lower ⅔ of the inner length of the corridor (not shown in the illustration) – calligraphy describing light, knowledge, respect, love, peace. Roshanai is a tunnel of light and sound. Rotary solenoids will control metal hammers that create a rhythmic sound on either side of the traveler. Sensors are placed at either end and several locations in between for an interactive sound effect. When participants enter the tunnel, the hammers start striking in sequence down the corridor, creating a sound wave of varying pitch (Doppler effect). The syncopated cacophony of metal on metal surrounds you, traveling towards and away from you in waves. As more people enter Roshanai the sound hammers begin to syncopate and move through a series of tempos from classical rhythms to modern compositions. When the tunnel is empty of people it is silent. Roshanai is Farsi for “illuminate,” which describes the physical and philosophical aspects of this piece. As a member of an Iranian family, I was driven by recent racist and anti-Muslim sentiments to create appreciation for the beauty of the ancient and diverse culture of Islam. As an artist, I designed elements that symbolize unity and a form that would practically force a change in perspective. The best thing that we can do to fight the terrorists is to love one another and not give in to the hatred and violence engendered by racial and religious prejudice. Roshanai is a path of enlightenment, literally and conceptually. Posted on January 26, 2016 August 20, 2017 by jake. This entry was posted in Charles Gadeken, Client, Concept Development, Design. Bookmark the permalink.